With the new Z8E decanter centrifuge, Flottweg is extending its product range and setting new standards. Right from the start of development of the Z8E, the target was set of concentrating on the specific requirements of an extremely wide range of industries. The modular design of this decanter centrifuge means it is possible to adjust optimally to all kinds of separating tasks. 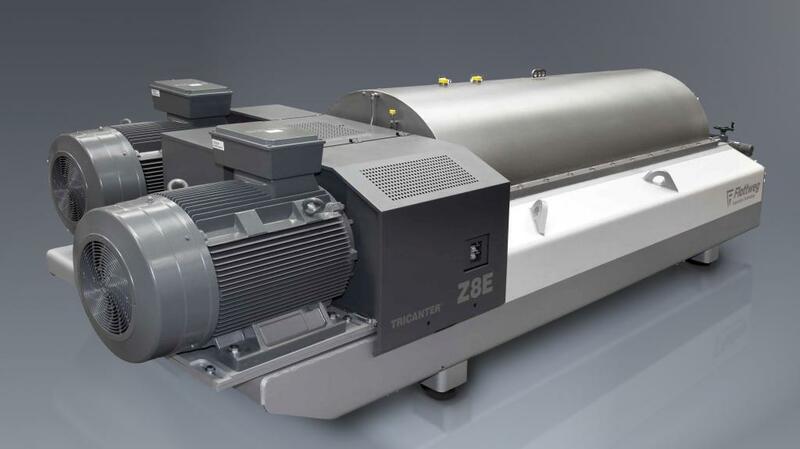 Irrespective of whether two-phase or three-phase separation is involved, Flottweg always has the right machine configuration available with the Z8E decanter centrifuge. The Z8E Decanter Centrifuge is Regarded as the Largest Decanter With an Adjustable Impeller. But what actually is an adjustable impeller? Normally, the clarified liquid runs out of a decanter without pressure. As an alternative, it is possible to transport the clarified liquid away using an impeller. This means it runs out in a closed system under pressure. A further development of the impeller is the adjustable impeller. In this variant, an adjustment mechanism alters the position of the impeller. As a result, the liquid can be removed at different diameters, thereby also optimising the separating performance. Bowl diameter 770 millimetres, maximum rotation speed 2650 rpm and an enormous torque of 24,000 Newton metres make the Flottweg Z8E what is currently the world’s largest decanter centrifuge with an adjustable impeller. To achieve the output of 24,000 Newton metres torque, the Flottweg Z8E decanter centrifuge features an expanded and modified SIMP-DRIVE®. This gear unit drive regulates the differential speed between the decanter bowl and decanter scroll during ongoing operation, depending on the scroll torque. This means the output solid is guaranteed to have the greatest possible quality. Oil/air separation for minimal oil consumption, high operating reliability because of continuous monitoring of the oil and air pressure, and protection against dirt penetration because of slight positive pressure.